Yuvraj Singh has launched his first fashion label YouWeCan and yes, we believe Yuvi definitely can do something this unique. Don’t you agree? This isn’t the first time that a celebrity has set foot into the fashion world but this is a bold fund raiser movement that the cricketer has taken up here. Shantanu and Nikhil, the remarkable designers have collaborated with Yuvi for his debut collection and rendered great support. Cheering for the cricketer and walking the ramp for him were sports-persons Virender Sehwag, Ishant Sharma, Rohit Sharma, Mohammad Kaif, Zaheer Khan, Chris Gayle, Dwayne Bravo and many more. 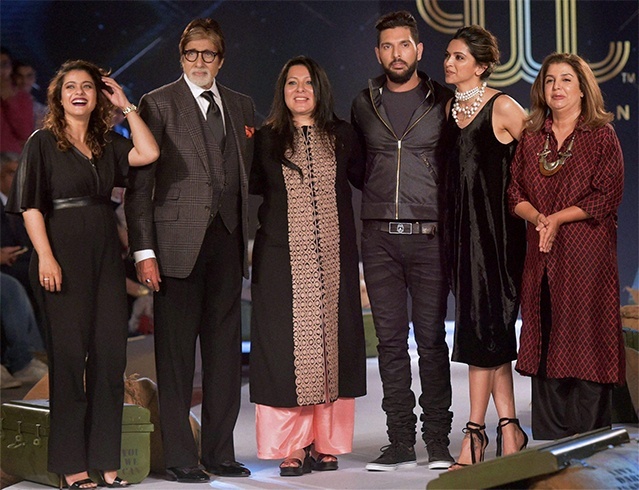 But what caught our attention apart from the splendid collection were the B-town biggies and beauties. Here is a roundup of their appearance at the event. We are very familiar with Sabyasachi sari collection but here we have Deepika pulling out a sizzling velvety black outfit by Sabyasachi. To the loosely fit dress, she added sparkle with a choker style layered pearl necklace from Isharya. With a Saint Laurent handbag and ankle strap sandals, she rounded her look classy. It’s maxi time for Neha Dhupia. We have been spotting the lovely lady enjoying this style quite lot these days. In a Payal Khandwala green and black maxi dress, she looked very smart and chic. To this loaded outfit, she added a gold choker and Bottega Veneta clutch. The long legged lovely lady killed it in Deme outfit for the launch. Flaunting her sassy legs, she paired the satin slip dress with a jacket. With slight curls, strappy sandals and a sling bag, she kept it simple yet sensuous. Have to agree that the grand launch to help young entrepreneurs expand their business was a great success and definitely eventful. We are looking forward to lay our hands on his collection. What about you?